Pierce Brosnan wears white poplin, ivory poplin and blue end-on-end shirts as well as a pleated fly-front dress shirt from Sulka in GoldenEye. Originally a New York company, Sulka expanded to have stores elsewhere in the United States, in London on Old Bond Street and in Paris. Sulka closed its last store in 2002. Sulka was amongst the world’s finest men’s clothing shops, and costume designer Lindy Hemming made an excellent choice to dress James Bond in their shirts and ties for GoldenEye. Brosnan’s shirts have a moderate spread collar, bordering on a point collar. The collar points are about 2 3/4″ long, and the collar has about 3/8″ tie space. Brosnan wears shirts from Sulka with both double cuffs and button cuffs. The double cuffs have the link holes placed slightly off-centre further the fold, which keeps the cuff neater but hides the cufflinks further into the jacket sleeves. The button cuffs are rounded with a single button. The collar and cuffs are stitched 1/4″ from the edge, as they traditionally are. The placket is 1 3/8″ wide and stitched 3/8″ from the edge. The shirts have shoulder pleats under the split yoke in the back. I’ve noticed Mr. Porter stocking items from Sulka from time to time. Has there been a resurrection of the brand or does somebody else own and produce the label now? I like poplin quite a bit, and I am a bit embarrassed to say I also like cotton/poly blends. 100% cotton seems to be the traditionalists choice if marketing effort determines the consensus. There is no denying cotton has its advantages. I would like to see the double cuffs. I’ll see if there are any good screenshots of the double cuffs. If not I can post a photo of my Sulka shirt of the same vintage. Interesting how the placement of the buttonholes on the cuffs are in reverse from what Turnbull & Asser do. I’m curious Matt, what did you like about the ties? 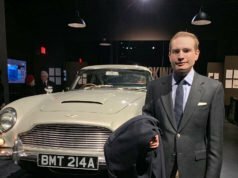 The one pictured above is tasteful, but I seem to remember a few that were rather ugly and seemed way too flashy for the character of James Bond. The placement of the cufflink holes aren’t consistent on all of Sullka’s shirts over the years. That’s how the ones on Brosnan’s shirts and on my Sulka shirt from that era are. I’m not really too fond of any of the Sulka ties, or even some of his Turnbull & Asser ties, but they are all very well-made woven ties. Brosnan wears white poplin with charcoal windowpane suit? And french blue oxford shirt, isn’t Sulka shirt? The shirt with the charcoal windowpane suit is ivory, not white. After getting the Blu-ray, the blue shirts in the film I think are end-on-end. All of the shirts are from Sulka. I like the collar. I do think the virtues of the wide spread collar are over-sung. The Hilditch and Key classic collar is a good example of a ‘narrow spread’ today. I also liked the shirts Kevin Spacey wore in the first season of House of Cards (bespoke G&H, I think). Patrick Macnee and Gareth Hunt wore Sulka shirts in the TV aeries The New Avengers, Timothy Dalton wore a couple of Sulka items in LTK and Roger wore Sulka shirts in the first few episodes of The Saint. John Gardner praised Sulka in some of his Herbie Kruger novels. 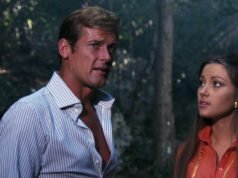 Roger Moore mentioned Sulka shirts in, I believe, a fourth series episode of The Saint. He was wearing a camp collar shirt at the time. Templar tells Colonel Latignant in the black and white fourth series episode “The Spanish Cow” that Sulka makes his shirts. It’s the only time I recall him mentioning the shirtmaker. I think it may be the proliferation of the skinny suit & tie trend, but I do find myself enjoying Brosnan’s wardrobe more now than I would have 5 years ago. I prefer his TWINE wardrobe, but I would take the Goldeneye suits Skyfall’s. They seem more sophisticated than their shrunken counterparts. Again, I may just be prejudiced due to a fashion trend hitting its saturation point. I even like the ties, as they almost seem refreshing when compared to the anemic and bland ties that are currently worn with a hint of irony. “Anemic and bland” is right – does anybody actually enjoy wearing narrow, limp, soot-colored neckwear? Roger Moore certainly did during The Saint! That he did, but he certainly wore the stronger neckwear of the 70’s with much more panache! Brosnan’s wardrobe was gigantic leap forward from Dalton’s. I love Lindy Hemming’s flair for co-ordination, and it really worked for Brosnan’s “Bond”. That said, sometimes I felt he looks like a bit like a 1980’s game show host (suit’s by Botany 500) but it still all looks rather nice on him! Fine shirts. In Australia, years ago, we had many peddlers selling all sorts of rubbish as Sulka products. I ‘ve been told it was the most counterfeited luxury brand in the world, until the fakers turned their attention to Rolex. The “Sulka” ties were notorious for the print washing off if the wearer was out in the rain. This can’t have been good for the Sulka house. 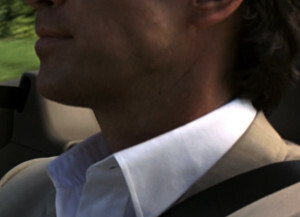 But I think the legit Sulka shirts/ties were right for the Brosnan era Bond, with the BMW convertibles and so on. 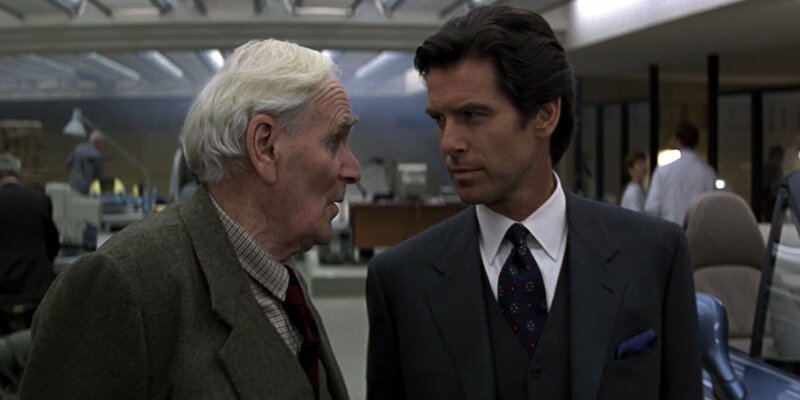 For some reason every time I saw Goldeneye I thought the shirts looked superior to the T&A and Brioni he wore after. The collar and cuffs just look crisper and cleaner to me, even though the other brands named aren’t known for poor quality products ! I just saw Golden Eye today . Weren’t ALL of the Sulka shirts with Double cuffs , Matt ? I don’t remember seeing a button cuff one. The shirt with the navy blazer has button cuffs.